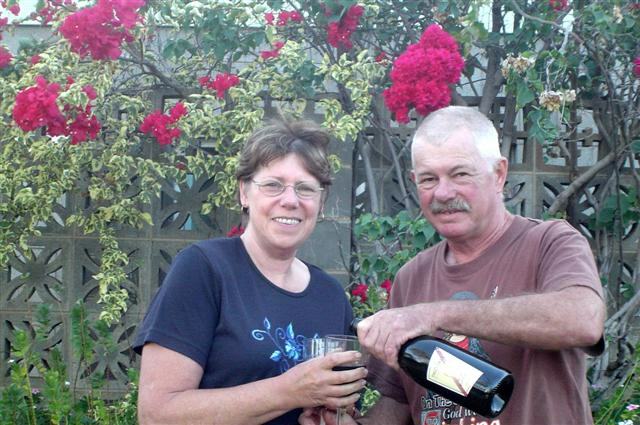 travels would take us to Cunnamulla this day and we’d been on the road for a little over two hours when we reached the town of Thargomindah where we decided to stop for a break. 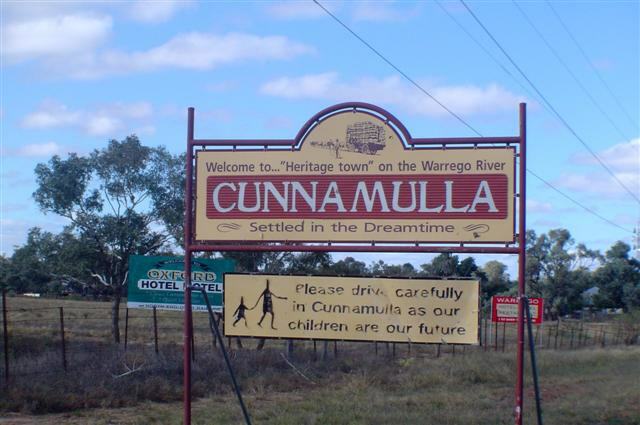 Thargomindah, from the Aboriginal word meaning “cloud of dust”, is a modern country town approximately 1000 kilometres (621 miles) west of Brisbane, and only a short distance, as the crow flies, from the historic Burke & Wills “Dig Tree” on Cooper Creek at Nappa Merrie Station. We filled up with fuel, had a coffee in the café, and were back on the road after about 30 minutes. The road was again long and straight in parts but at least we could see any animals that might have been along the sides. And there were quite a few, from sheep to kangaroos. We arrived in Cunnamulla about mid-afternoon and settled in at the Jack Tonkin Cabins and Caravan Park ([star][star][star]). It’s a nice little park but the attitude in reception did little to make us feel welcome. That said, we set up camp and then went off to explore. 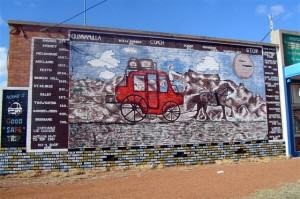 Cunnamulla originated as a settlement in the 1860’s at the intersection of two major stock routes. The name is derived from the Aboriginal term meaning “long stretch of water” referring to the Warrego River which passes through the town. We wandered down to the river and John even thought he might like to throw a line in, no doubt with the usual outcome, but then decided not to. The water was a coffee colour, most likely from the rain they’d had recently although one of the locals did mention that there is a lot of European carp in there and they tend to mess up the bottom and make the water muddy. So we continued on into the town itself and visited a park where there is a rotunda and a memorial to those who served in time of war. There’s also some quite interesting wall-art. Graffiti with class, no less! At the Cunnamulla Fella Centre we found the magnificent bronze statue to the “Cunnamulla Fella”. In the boom times of the 1950’s and 1960’s large properties in the area employed hundreds of young men who worked from sun up to sun down, 7 days a week, mustering sheep and cattle and breaking in horses. When they came to town the pubs would overflow and the young fellas could be seen squatting around the streets in a pose that became part of the Australian legend and even today conjures up nostalgic images of stockmen and days gone by. 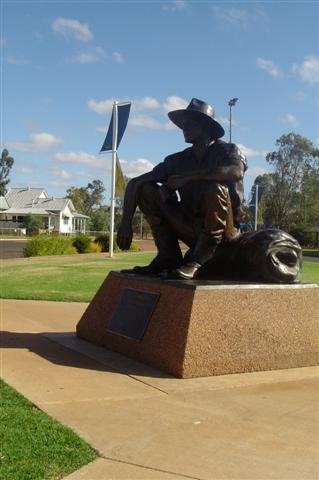 In 2005, a statue commemorating these fellas was erected in the main street and called the “Cunnamulla Fella” and they were immortal­ised in the song “Cunnamulla Fella” by the legendary Slim Dusty and the song’s composer, Stan Coster. 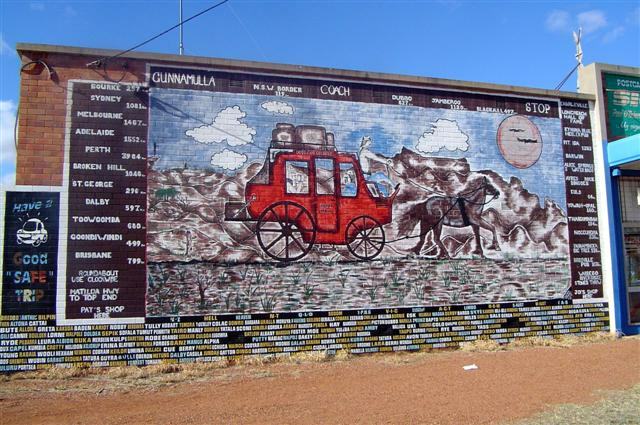 The Cunnamulla Fella Centre houses the Regional Art Gallery and Museum as well as displays such as the Artesian Time Tunnel which tells of the dinosaurs that roamed Australia millions of years ago, the history of opal mining in the area, and the Great Artesian Basin. The water that flows from the Basin is the lifeblood of the Outback. There’s a lot of history in this town and it was once home to Breaker Morant and Nancy Bird-Walton, two of our most famous historical figures, as well as one of our nation’s great pastoralists, James Tyson. But late on a Sunday afternoon very little is open and we, unfortunately, missed a great deal. We returned to camp for our first night bubbly and wandered into the gardens where all the flowers and shrubs were in bloom. It was a perfect way to end our brief visit here, relaxing in the garden with a bottle of Two Tails Sparkling Wine. 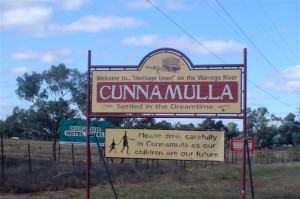 Perhaps one day we’ll return to Cunnamulla when we have more time; I have a feeling there’s more to this town than meets the eye and it would be great to spend a few days here.